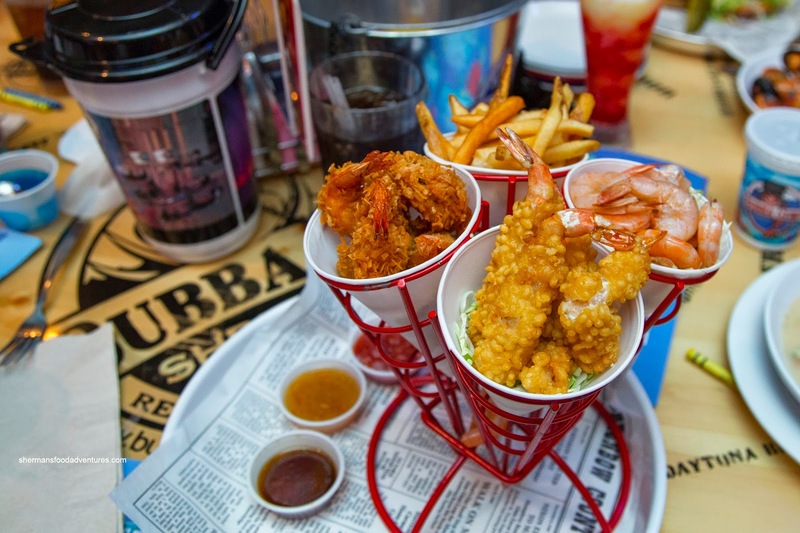 Sherman's Food Adventures: Bubba Gump Shrimp Co.
During this trip, the name of the blog should've been temporarily renamed "Sherman's mediocre chain restaurant adventures". Yup, after a long day at Universal, we didn't travel very far for dinner. 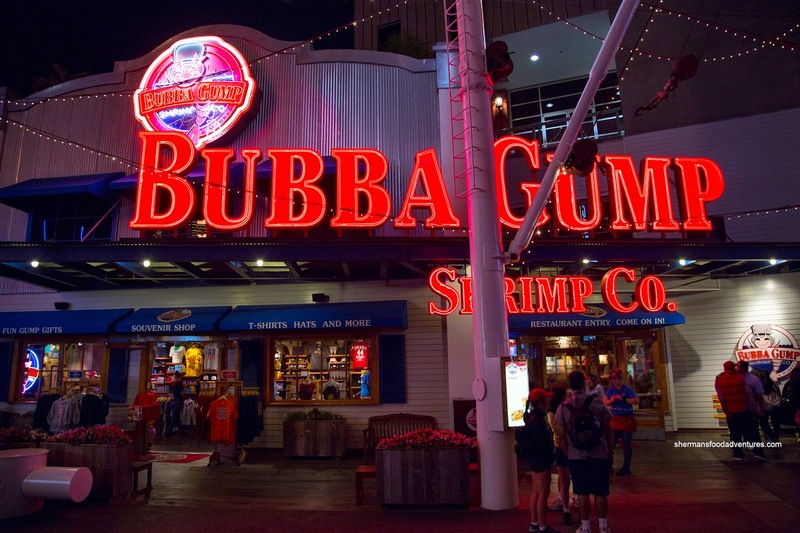 In fact, similar to Downtown Disney, we took a walk through Citywalk and ended up eating at Bubba Gump Shrimp Co. Yup, a whole restaurant chain spawned from the success of Forrest Gump. But at the very least, Viv and I have tried the restaurant before, albeit Ala Moana Center in Honolulu. 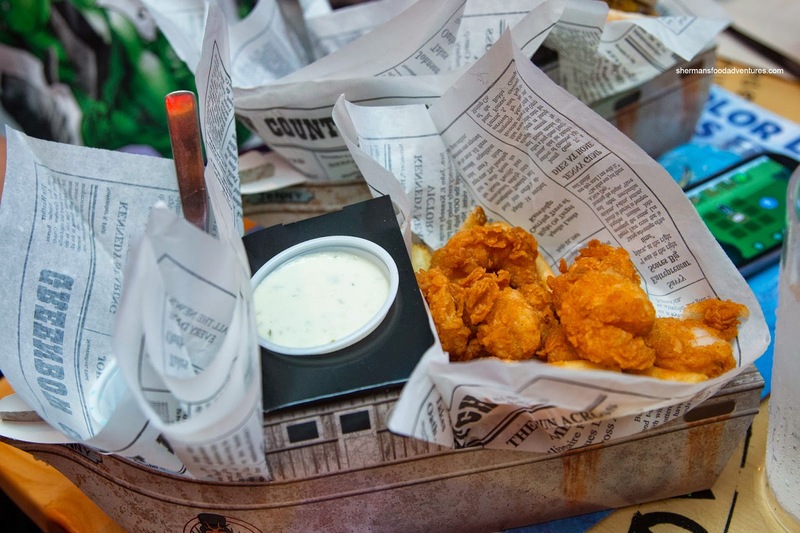 And much like the last time I dined at Bubba Gump in Hawaii, I had the Shrimp Heaven featuring tempura shrimp, peel n' eat shrimp and coconut shrimp. Sadly, this was mostly a disaster with raw batter on the tempura shrimp while the coconut shrimp was inconsistent as many of the pieces had not much coconut. The peel n' eat was okay but not with enough coldwater snap texture. Even the fries were kinda soggy. They did offer up a 10% discount for the uncooked batter though. 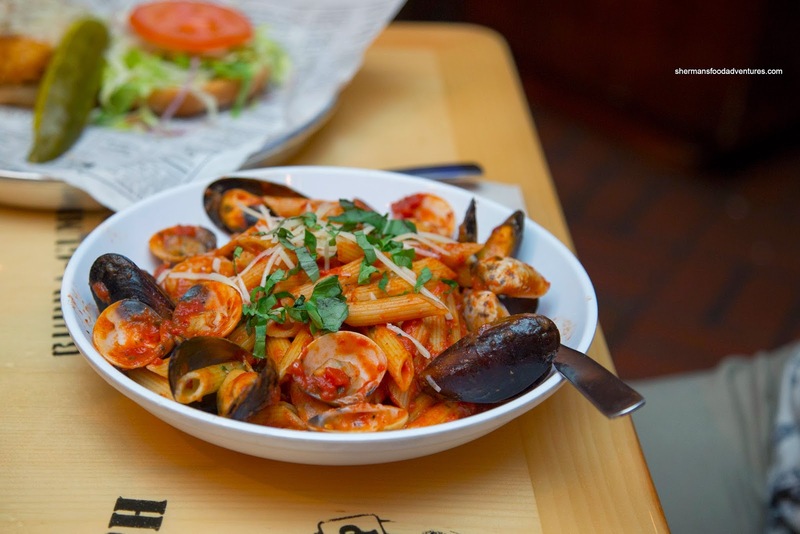 Viv had the Seafood Pasta that featured sautéed shrimp, mussels & clams in Bubba’s favorite garlic butter wine sauce, served on penne pasta, tossed in a homemade marinara sauce. The al dente penne was doused in a spicy tomato sauce which lingered. This was actually not bad with a notable spice and well-prepared seafood. Portion size was large where Viv could not even finish it. Louisiana special sauce and Pepper Jack cheese. Unfortunately, the batter was undercooked as well. Hence, it was slightly crispy yielding to a mushy doughy interior. The fish was flaky and moist though. With the small amount of sauce, the sandwich lacked zip as well (although the sauce itself was quite good). 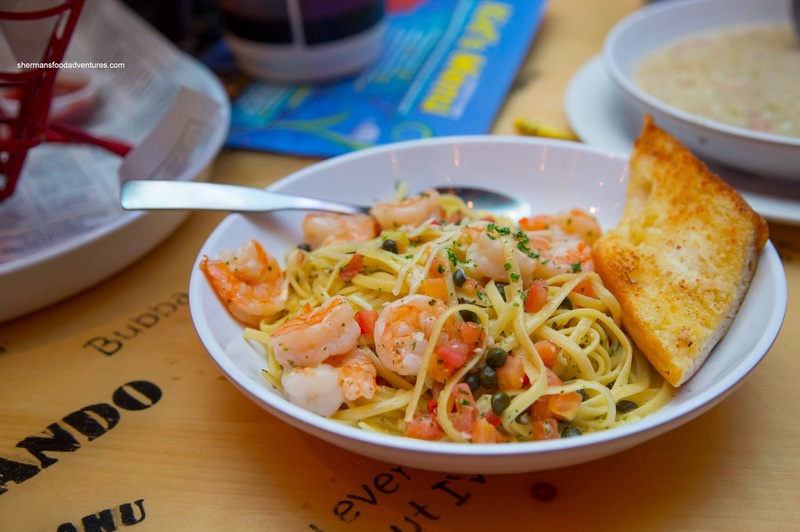 Costanza went for the Shrimp Scampi with capers and lemon garlic-butter. Faithful to its description, it was very buttery, garlicky and in particular, tart. For me, that was good since it meant plenty of flavor for the al dente pasta and crunchy shrimp. I personally liked it due to the right balance of bold flavors, but he thought it was too acidic for his tastes. 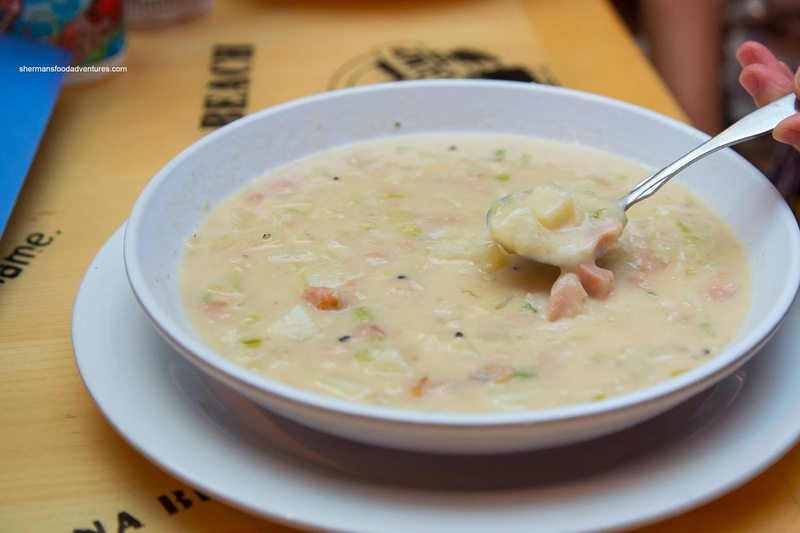 My daughter had a bowl of the Old Fashioned New England Clam Chowder which was only moderately creamy. The flavor profile was dominated by celery and onions rather than the taste of the sea. However, it wasn't a bad soup per se with lots of buttery tender clams. And as you can probably figure out, the size of the bowl was rather large. My daughter couldn't finish it. My son had the kid's Popcorn Shrimp and it was slightly underdone as well. Hence, it wasn't crunchy. Rather, it was a bit crisp with plenty of soggy portions. The shrimp were okay though with a light cold-water snap. And just like the fries in my meal, these were soggy as well. 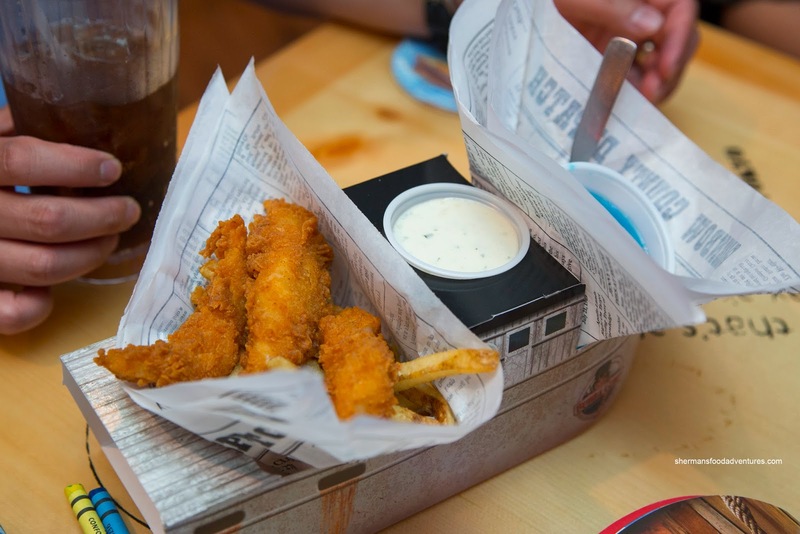 There was also the kid's Fish n' Chips at the table and I thought it was okay with crunchy batter and flaky fish. For some odd reason, the batter here was cooked all-the-way through unlike the other fried dishes as our table. But then again, the fries were consistent, being soggy. Yet, did we expect any better? Yes and no. I distinctly remember that the food was better the last time I had it, however, that was awhile ago and a 5-hour plane ride away. 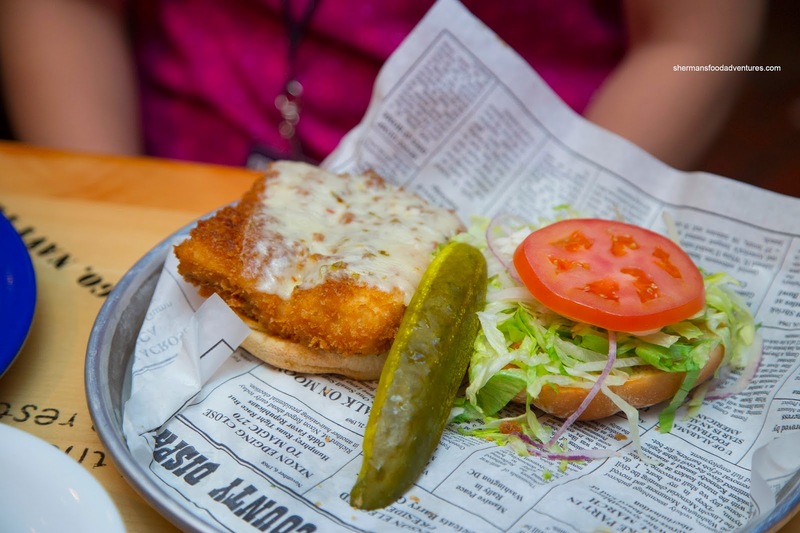 It was quite apparent that they rushed the preparation of the fried items, which resulted in underdone food. Ultimately, we were fed, but at the prices we paid, we expected a little better execution on all items.